Mary Marsich, aka Texas Mary died in 2008. 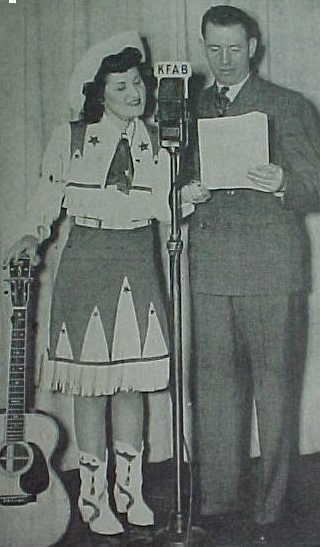 She had performed as yodeling country western singer on KFAB-AM in Omaha, NE for 46 years. Despite that tenure there is precious little written about her career. She was not an Omaha native but spent most of her life there. She was born in Iowa, in 1917 and didn't return there until 1995. There is so little written about her that I first heard of her from her obituary. Billboard referred to her less than half a dozen times over her career. I can guess from her birth date that she started at KFAB around 1938 and retired in the early 1980s. Her few press clippings seem to confirm that time line. She first appears in billboard in August of 1943. She was already sufficiently famous to get written up over her recovery from a "bone disease" and her return to KFAB from the Mayo clinic. It said that "Texas Mary made 17 trips to the hospital and underwent 13 operations at the Mayo Clinic, Rochester, Minn. in her fight for health that finally returned. The flood of mail, flowers and candy from KFAB fans that followed her caused her doctors to ask if she came from Hollywood." At the time She had a 15-minute daily broadcast at the time and had been with the station about 5 years. By the mid 1940s she was a part o a larger group, Eddie Sosby and the Radio Rangers. They broadcast three times and Mary was a draw. Another Billboard article noted in 1948 she was still with the band doing a new program "Hi, Neighbor!" a 45-minute long show. At the time the line up included Texas Mary, Alene McKinney, the Melody Masters and the Uptowners. The article somewhat indicates that she's performing with the band as opposed to as a member of the band. It's unclear. In 1950 the Radio Rangers signed a deal with 4-Star records. That same year they appear on WOW-AM, another Omaha station. It's hard to tell if they were playing both stations or had crossed the street. But either way, it appears that Texas Mary didn't make the trip to 4-Star or WOW.